Sign the petition! 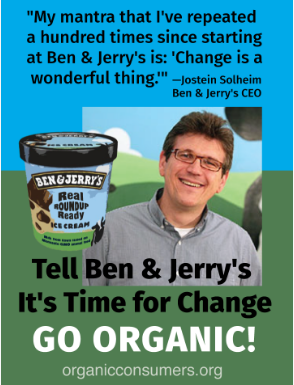 Ben & Jerry’s CEO Jostein Solheim (aka Scooper Man): Tell Ben & Jerry’s CEO: Get pesticides out of your ice cream. Go Organic! Sign the Petition! Tell Ben & Jerry’s to go organic! Wow. Ten of 11 samples of Ben & Jerry’s ice cream tested positive for glyphosate, the active ingredient in Monsanto’s dangerous Roundup herbicide. • Running Vermont family farms out of business. • Contributing to climate change. • Putting human health at risk. In addition to the above problems, pesticides like Roundup, atrazine and metolachlor—all carcinogens and endocrine disruptors—have devastating effects on human health. And they’re in Ben & Jerry’s ice cream. It’s time for Ben & Jerry’s to come clean. The only way to do that is to transition to a 100% organic supply chain. TAKE ACTION: Tell Ben & Jerry’s CEO Jostein Solheim (aka Scooper Man): Roundup-Ready Ice Cream is neither ‘natural’ nor ‘socially responsible.’ Go 100% Organic!